Advertiser.ie - Voice Over Casters for ‘Game Of Thrones’ and ‘Love/Hate’ comes to Galway for unique Workshop! The truth is, Voice Over work is real. There are real opportunities for undiscovered voice talent. Voice Overs are heard on radio ads, tv ads, feature films, on-hold messaging, audio books, e-learning, animation, computer games, and so much more. Voice Over is everywhere. Ordinary people from all over the world make an income from working as Voice Overs. And, yes, it happens in Ireland as well. 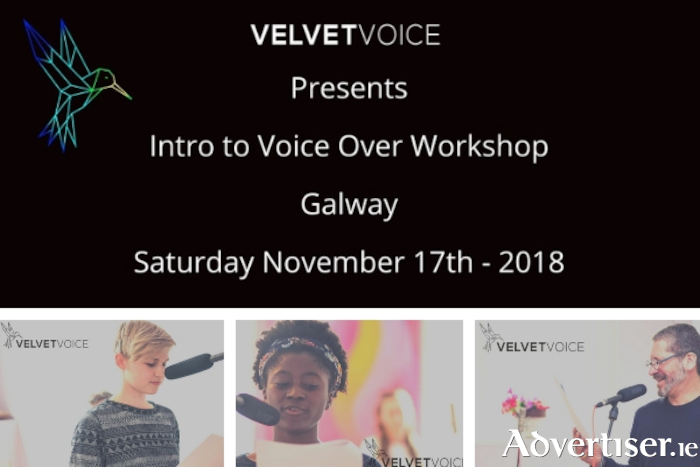 At their Galway workshop this Saturday, let’s find out if voice over is for you. Velvet Voice can teach you how to break through fear and nerves so that you feel confident speaking on the microphone. Could you be a voice over? Would you give it a try? They will give you space and support to find out. Since 2006, Velvet Voice has helped people just like you break into the world of commercial voice-over work. They have cast hundreds of voices for many projects including ‘Game Of Thrones’ and ‘Love/Hate’. Their latest casting work includes features like ‘Never Grow Old’, RTE’s ‘Taken Down’ & ‘Blood’. They know who they are casting. They know why they are casting them. Come to the workshop this Saturday, November 17th and they will work with you to assess whether or not voice over is for you. Workshop Fee - €45 participant or €55 Performer, click here to book!